Whether it's stunning works of art, exhibitions highlighting the rich culture of the state, or venues for vibrant educational opportunities, Arizona's museum selection is among the best. Discussed below are the top 10 museums and galleries in Arizona that you just cannot miss! Located in Phoenix, the Heard Museum of Native Cultures and Art showcase Native American art and cultures. It aims at educating the people about the heritage and traditions of the Native population, especially that of Southwest. And the festivals feature native art forms, authentic jewelry, and folklore. This Tucson-based museum is among the most visited tourist attractions of southern Arizona. It focuses on the natural history and evolution of plants and animals of the Sonora Desert. Consisting of a zoo, botanical gardens, art gallery and natural history museum, the 98-acre plot is home to more than 230 animal species and 1,200 plant varieties. This museum is known for its international art exhibitions, featuring more than 18,000 classical and contemporary art pieces from America, Europe, Asia, and other continents. The largest art museum in southwestern America, the Phoenix Art Museum hosts a plenitude of cultural events and festivals featuring live performances, educational programs, and art films as well. The Museum of the West is a museum dedicated to the art, culture and history of the 19 states of Western America. Set in Old Town, Scottsdale, Western Spirit is "not a museum of objects but a museum of ideas." The world's largest aerospace museum, the Prima Air & Space displays about 300 aircraft and also features an Arizona Aviation Hall of Fame. Located in Tucson, this private museum is spread out over 80 acres and has exhibits all about aerospace and the aviation sector. The building was originally known as State Capitol and was home to Arizona's territorial government. 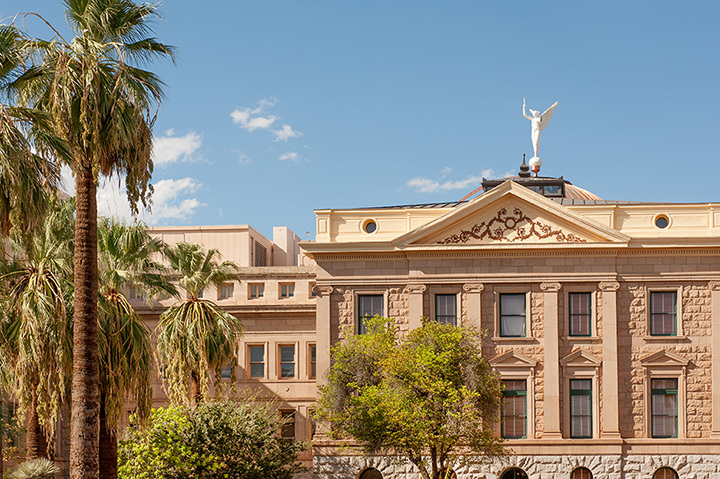 However, after Arizona became a separate state in 1912, the statehouse was relocated and the building preserved as the Capitol Museum. It focuses on educating the people about the constitution and the evolution of Arizona from a territory to a state. This place celebrates contemporary art, and features art exhibitions of both established and amateur artists. Based in Tucson, this museum has displayed the work of artists such as Takashi Murakami, Roman Signer, Gary Panter, and others. Set in Chandler, the Arizona Railway Museum features an extensive collection of railroad rolling stock and a detailed history of railway in southwestern U.S. Two of the items displayed in the exhibition are even listed in the National Register of Historical Places. This Phoenix-based museum is a tribute to the fire-fighting heroes round the world and presents a chronological evolution of the fire-fighting equipment used over the years. It also has a National Firefighting Hall of Heroes dedicated to the hoses and later motorized apparatus used for putting out fires. The DeGrazia Gallery in the Sun started out as a small construction project in the 1950s but gradually developed into a 10-acre historical site designed and constructed by Ettore "Ted" DeGrazia (1909-1982). Famous for its Renaissance oil paintings, sculptures and ceramics, this gallery in Tucson offers the perfect blend of art and history.